Late for Service | Flickr - Photo Sharing! I was in Detroit on a Sunday and thought I should go to church - I must have read the schedule wrong as it appears I was a little late for service. 9Migue9, Paul_Paradis, and 515 other people added this photo to their favorites. Nice composition and sublime photo, very nice in monochrome. Great perspective, Scott Great depth!!! Very nice B&W image, Scott. You don't have many B&W images but you always choose the good ones. Looks like you were Big Time Late ! Dein Bild ist sehr eindrucksvoll und weist eine tolle BQ aus! I love abandoned places like this. You were able to post the shot so you obviously got out safe and sound. Your b & w is amazing. It seems to be quit late for service, Scott! You might have tried in another institution. 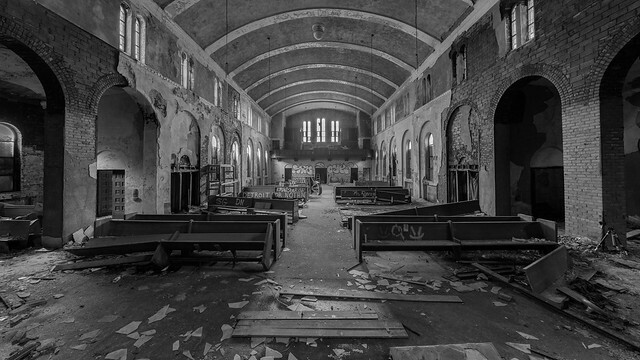 WOW.... a lost place.... unfortunately in Detroit. What a Hammer Location. I zoom in and on ..... enthusiastic !! !